These past weeks have been tough (yesterday was one month since our loss), and only in the last few days have I even got back to doing some kind of sewing, however simple. (Meanwhile, the boys are happy with the curtains I made for their room, and the decorative pillow cases I made for our bed look very nice. It’s good to sew again.) I know there has been lots of Harry Potter related posts lately, but really, except for feverishly organising my house, that’s been pretty much all I’ve felt up to. Of course, Halloween is creeping up on us, so that is another reason. Bear with me, I’ll get back to historical sewing eventually. As I was going through my stuff, organising and purging, I came upon a tiny book, you know the kind you’ll be given as a present, filled with quotes on certain topics, which you end up never reading after that first time. Well, as this one had been in a box for five years or so, I saw no reason to hold on to it as it was, but thought the cover might be of some use for my annual Halloween party. Just a note to all the book lovers out there: this was a contemporary book with thousands of exact copies, it was never a great contribution to the world and won’t be missed. I’d never destroy a book of value. It was clear that I would re-cover the book, and that the pages wouldn’t be needed. I carefully cut them out, then looked for a suitable paper for the book I had in mind among my scrapbooking supplies, and came up with one that almost had the look of cracked leather. Perfect. Unfortunately I forgot to take a ‘before’ picture, but you can clearly see on this look at the inside that the book has a new cover. I messed up a bit, and the corners ended up too short; however, I saved that situation later. 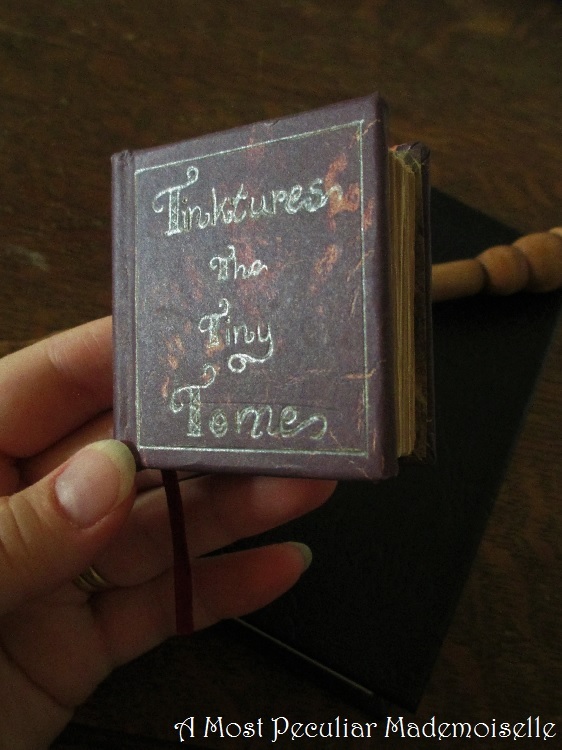 I had decided on a title early on: Tinctures: The Tiny Tome. I messed up again when writing the title, and I used a ‘k’ instead of a ‘c’. That’s what happens when English is not your primary language, you work on things that require thinking too late at night and don’t double check the spelling. Ah well, maybe the book was produced by a foreign publisher? I pencilled the title and frame first, then filled them in with gold pen. After the ink had dried, I traced the title and frame with a knitting needle, to make shallow indentations which made it feel more like a real book. I was very happy with the result, but then I started thinking… Instead of only using this as a prop, what if I actually made it into a real book – a guestbook? 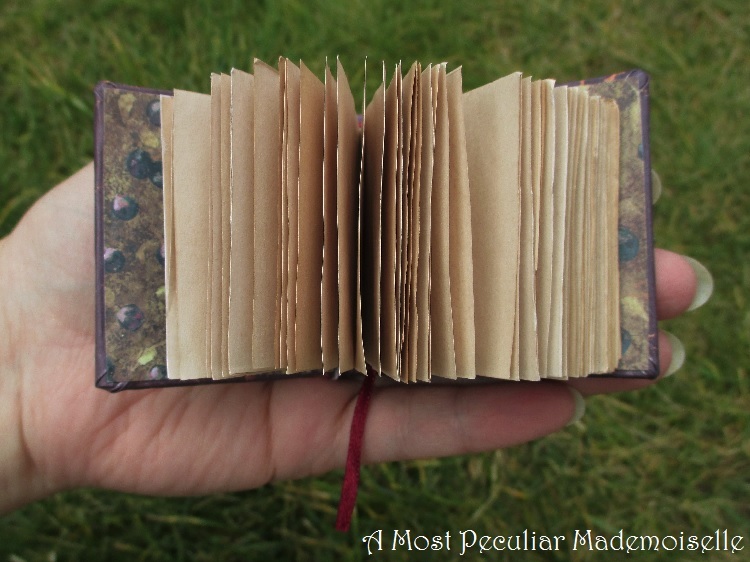 I like the idea of a tiny guestbook, as I never know what to write in the full sized ones. I cut out pages from tea dyed printing paper. 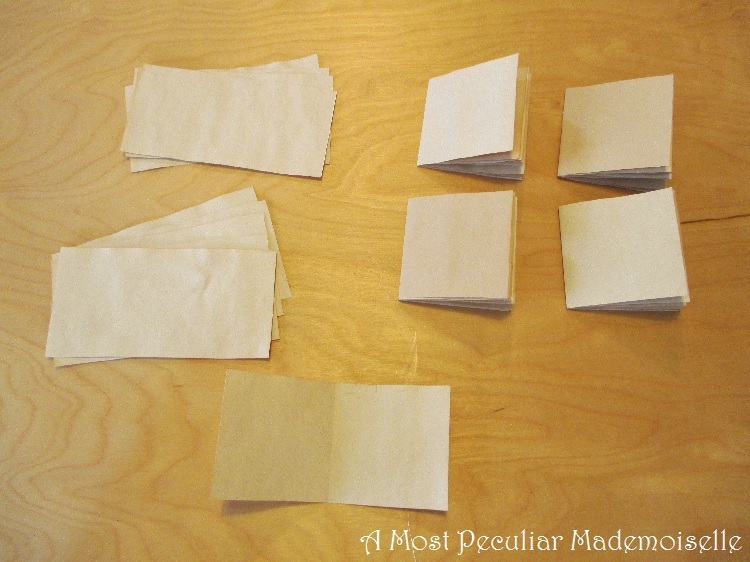 One paper gave ten pieces, twenty pages when folded in half. I used three sheets of paper, as sixty pages sounded like a good number. The different sheets had slightly different shades, as I didn’t time how long each one was in the tea. To avoid this being too obvious, and giving a more natural look to the pages, I mixed them up. 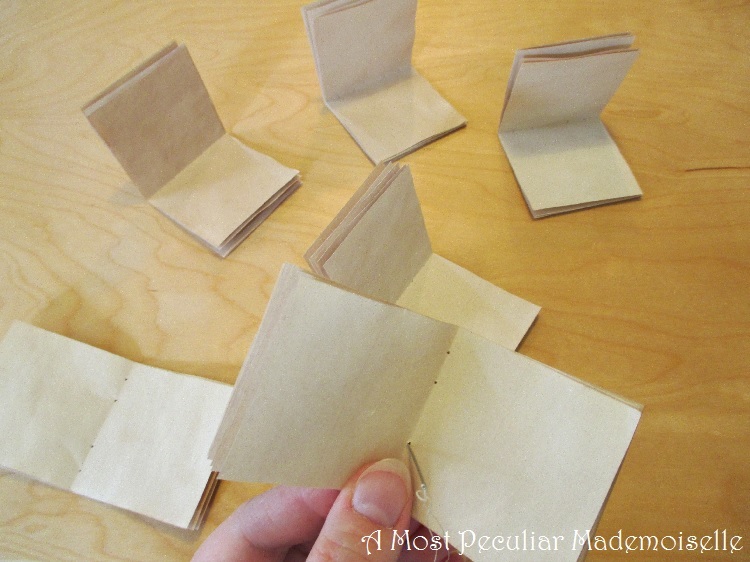 I organised the folded-in-half pages in groups of five, then I made holes in them in preparation for sewing them together. 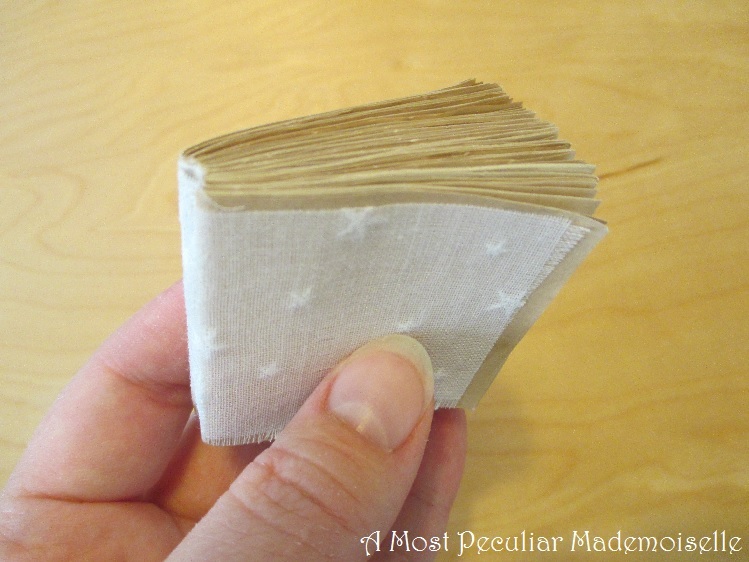 Sewing book pages together is really very fun to do. 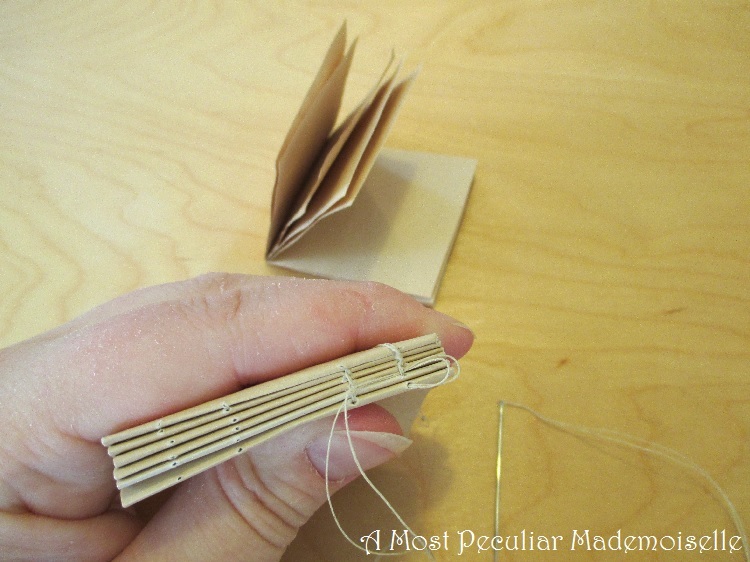 My husband (who is interested in bookbinding) and I agreed that someday we’d like to take a class to learn it properly. As I’m not a pro at this, I’ll refer you to the blog post from where I learned how to do it, by Making My Rent. 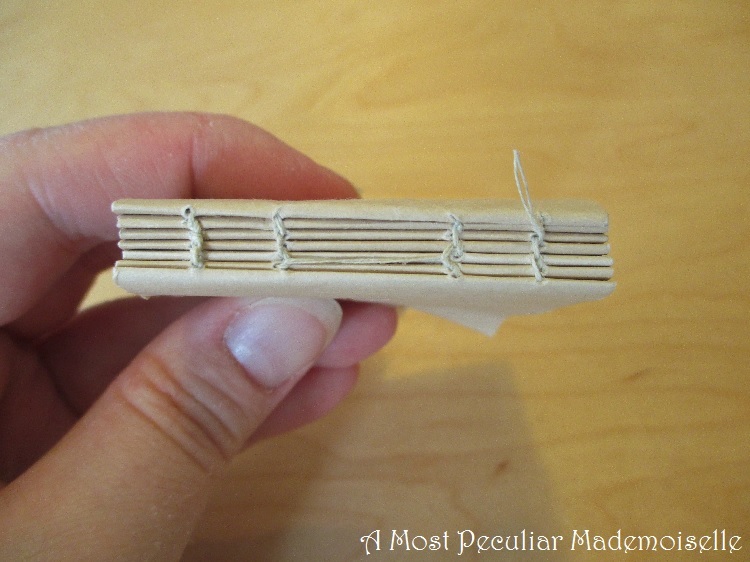 I managed to pull too sharply at the thread when attaching the second group of pages, and broke them. Boo. Fifty pages seemed too few, didn’t fill the book up enough at all, so I decided to make new ones. Rather than having half a sheet of paper left, I used a full one, and ended up with a total of seventy pages. Much better. The rest of the sewing went smoothly, and the result looked rather neat. 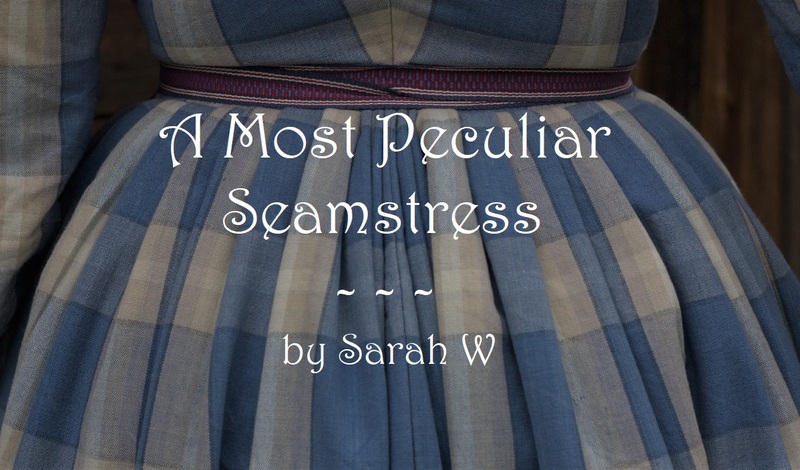 “Too bad no one will see it”, was hubby’s reaction, but that’s what blogs are for. I sort of followed the steps of the tutorial, gluing the spine, gluing on thin fabric – I didn’t have the proper material (scrim?) for this, so had to pick something from the fabric stash. And here’s another of those moments when you’re glad you have a blog – doesn’t the stars seem like a typically wizardy thing to have? It will never show, but I’m sort of pleased they’re there. 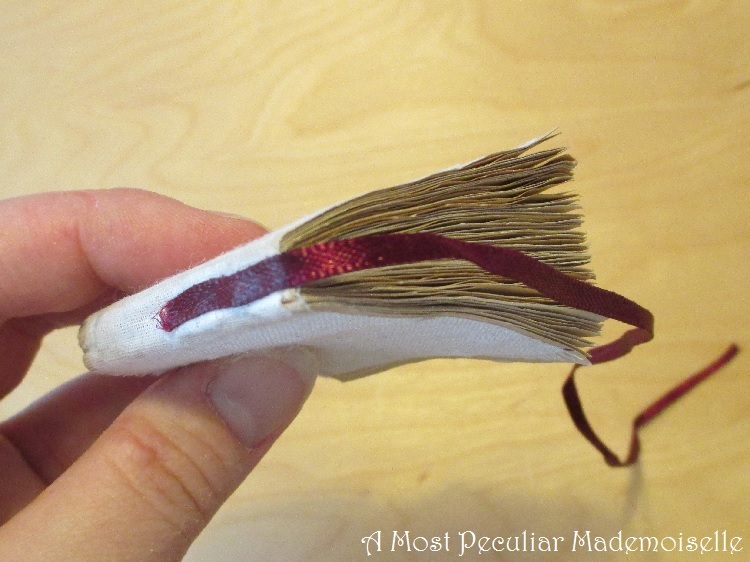 I glued on a narrow satin ribbon that would be the bookmarker, and then a wider satin ribbon as headbands. 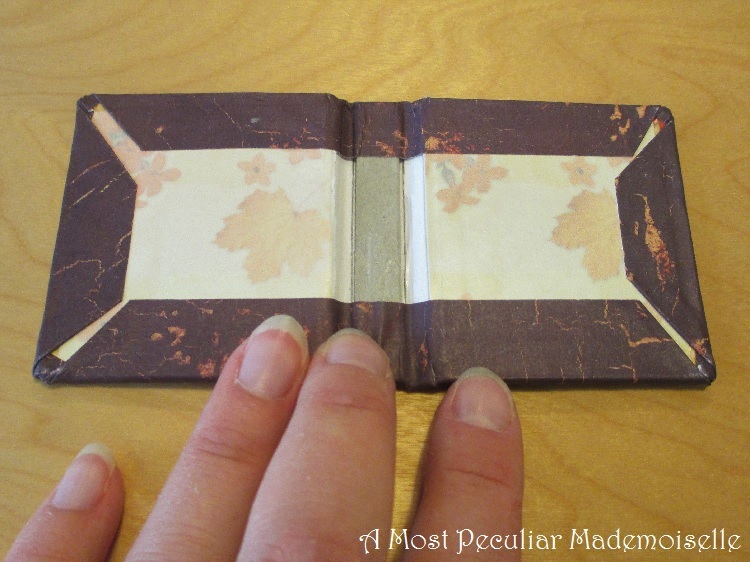 I glued in the pages, attached the endpapers covering the insides of the book and let the book dry under a heavy cookbook. This is where I saved the mistake I made earlier, by gluing the papers rather closer to the edges than I would otherwise have done. I trimmed the endpapers a bit, and that was that! 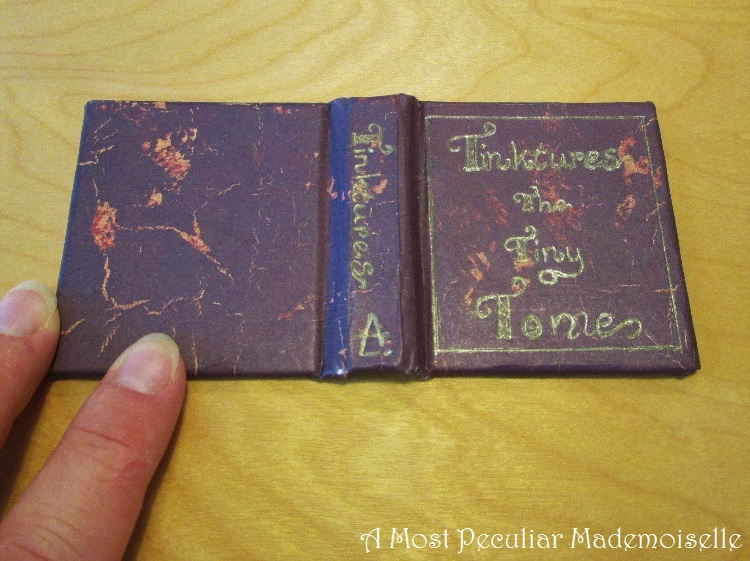 A small book, decoration and guestbook in one, perfect for my annual Harry Potter inspired Halloween party. My kids are looking forward to draw in it, for of course children will be as welcome to sign it as adults. What do you think of guestbooks, love them or hate them? Superfin bok. Jag är så imponerad av alla dina hantverk. Very nice! 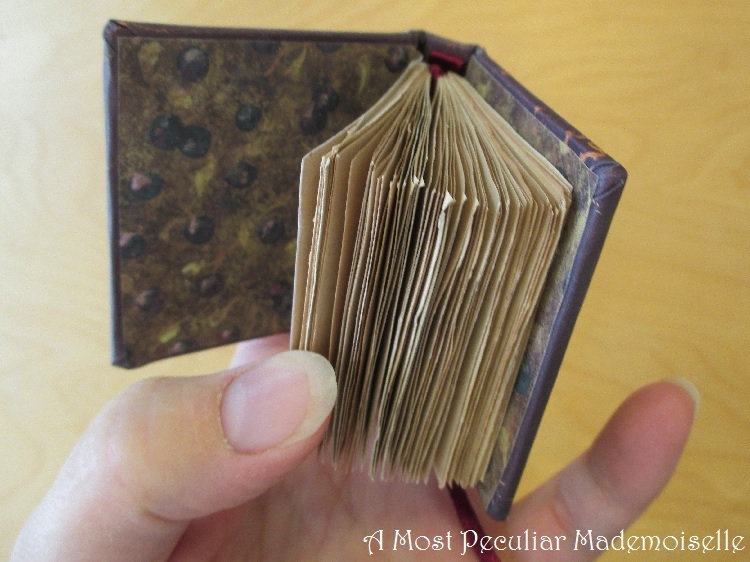 I hope someday to mess with bookmaking- I'd especially like to work on leather-covered books. As a child, I would have been interested to do it, but thought it was 'too hard' because of how neat Real Books look, and consequently I made the assumption it was only something 'professionals' could do. I aim to prove my Past Self wrong. As pertains to guest books- I don't like them if I have no idea what to write. It feels like being put on the spot. I would prefer if I could just write my name, maybe a tiny bit else, and draw a little. Maybe I need to be content with that, and let other people Deal with it.